TritonWear Live: a fully revamped mobile app! We've done a major overhaul of the mobile app (version 0.1.0) to make it easier and more useful for you to use. Update your app today! We cleaned up the way the app looks to bring it in line with TritonWear Insights, and also simplified the Set Up Groups process. Compare Speed vs Stroke Rate – or any other two metrics – on the same graph to better understand how your athletes are training. Multiple metrics is also coming soon to TritonWear Insights. Take photos of your workout buildout, your athlete's technique or a screenshot of the app and upload them with your workout. These photos can be set to Public so your entire team can view them later on TritonWear Insights, or Private so only you can see them. From the individual graph screen, see the distance and number of laps an athlete has completed, in total or broken down by stroke type. This update is also on TritonWear Insights. 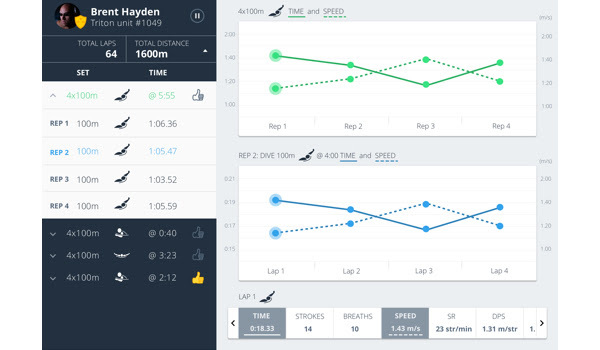 Choose which metrics to show on the athlete tiles – for both Reps and Laps. You can customize it per athlete, or for an entire training group.